Hi. I’m Micha. I used to be a blogger. I wrote a book. I’m in love with poetry. I’m the mom of three boys. I believe deeply in rest, but I’m only just learning how to do it. I don’t believe in email. I am utterly against email. I am pro sunshine and interpretive dance. I love Jesus and would like to chat about that guy all day long. (Also, I think you can believe in Jesus and still be committed to intellectual integrity.) My kids are imperfect. So am I. So is my husband. We have real problems (not the acceptable social-media kinds of problems either), and we have a lot of love. If you want to talk about that, I’m up for it. I am certain there is deep joy to be found in suffering, though I’m only just beginning to understand what that means. I have a daily 5:45 am date with my yoga mat, and a coffee date with my husband immediately following. I used to know a lot about theology and parenting. These days I know a lot less and my answer to all the uncertainty is grace. I believe in friendship, psychotherapy, marriage, family dance parties, bearing one another’s burdens, and beautiful words, not necessarily in that order. I believe in city-dwelling and rural living (I’d like to do both at the same time but I’m not sure how) and reading and learning how to love the people you live with. I believe in asking questions, and building friendships with people who look and believe differently than you. I believe in leaning into doubt, in laughing, in hiking in the woods. I believe in the Trinity and am pretty sure I’ll never understand the mystery of holy relationship or the love of God we are all invited into. I believe in kindness, in manners, in inclusion. I believe peace on earth might be directly tied to how many babies in the world wear tiny glasses. (Hate cannot exist in the midst of babies in glasses.) I believe in ancient Christian spiritual practices and I believe in coffee—good coffee—brewed by my husband. I believe in your story, in what brought you here. I believe in our vulnerability, our strength, friend. I believe there’s no time for pretending this life is easy. But there’s all the time in the world for naps and music. I believe in ocean and prairie sunsets, consignment stores, kitten snuggles, grocery delivery, and avocados for breakfast. And I’m happy you’re here. Stay, okay? Let’s talk. 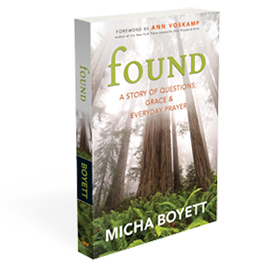 Micha is available to speak at your event. She leads spiritual formation retreats and speaks on a variety of topics, including motherhood, prayer, and special needs. Reach out through her Contact Page for more information.